An impressive tree of the wetlands in Kakadu National Park (and other Australian places, too). The bark is indeed softer than most types of paper and fairly thick. 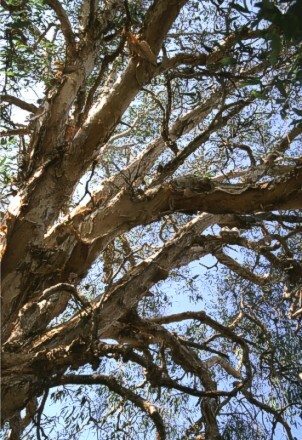 It peels off the way Eucalypts do and can give the whole tree a quite ghostly appearance. Apart from that the tree is a survival hero: The area they live in is seasonal flooded, so the water level regularily differs by metres! In such areas they are the only real tree I saw. It's also the place for River Pandanus.